Situational awareness: "Toys R Us fans in the U.S. should see the iconic brand re-emerge in some form by this holiday season," the AP notes. Nearly 5 million U.S. children used tobacco products last year, the Centers for Disease Control and Prevention warned today with the headline "Progress erased: youth tobacco use increased during 2017-2018." That's up 1.3 million from 2017 and is primarily driven by e-cigarettes, Axios' Eileen Drage O'Reilly reports. "Current users" are defined as people who've used a tobacco product in past 30 days, while "frequent users" are for those who've used the product for more than 20 out of the past 30 days. Why it matters: E-cigarettes are a multibillion dollar business that faces an existential threat should the Food and Drug Administration determine they're too popular among children. The FDA banned most flavored e-cigarettes last fall, citing their usage among teens. Some e-cigarette companies such as Juul announced their own self-policing prior to the crackdown. By the numbers: 27% of high school students and 7% of middle school students used a tobacco product in 2018. Between the lines: Juul was valued at $38 billion when Altria (the parent company of Phillip Morris) made a strategic investment late last year. Now the attention turns to whether companies valued so highly will have the economic incentive to keep their drugs out of the hands of teens. "I am aware of deeply concerning data showing that youth use of JUUL products represents a significant proportion of the overall use of e-cigarette products by children. I have no reason to believe these youth patterns of use are abating in the near term, and they certainly do not appear to be reversing." 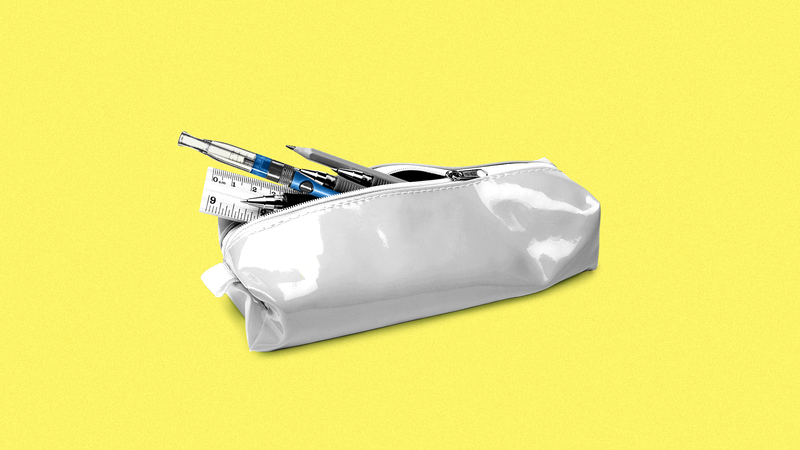 The bottom line: We don’t yet know whether Juul’s self-policing or the FDA rule changes — both announced late last year — have had any effect on e-cigarette use, and we won’t until later this year. 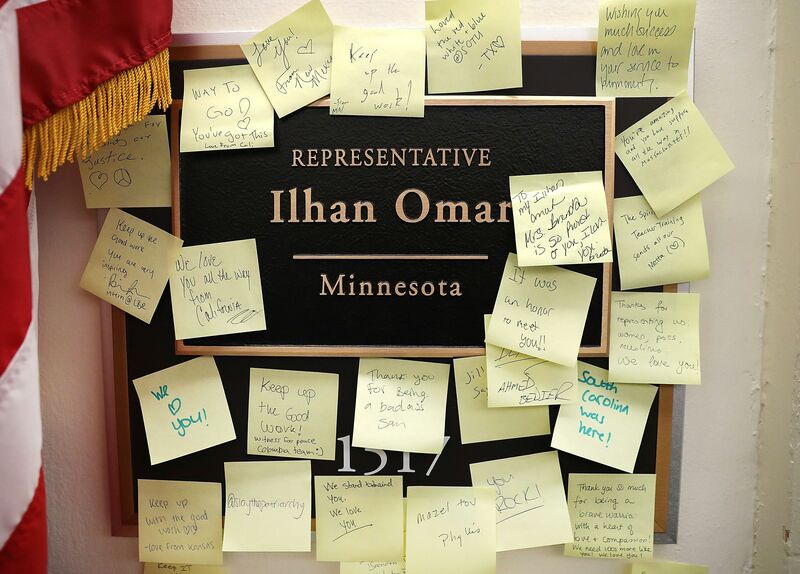 Notes of support are posted on the name plate outside the office of Rep. Ilhan Omar (D-Minn.) in the Longworth House Office Building. Omar apologized today for her tweets on Israel, which used stereotypes often perceived as anti-Semitic, saying that she is "grateful for Jewish allies and colleagues who are educating [her] on the painful history of anti-Semitic tropes." Go deeper. New analysis shows that U.S. tariffs on Chinese goods are chipping away at the trade deficit with China. But there are other questions to answer when it comes to whether the tariffs are having their desired effect. Go deeper. Sprint has sued AT&T over its "5G E" marketing, trying to stop the company from using the term for anything that's not real 5G. Go deeper. Morgan Stanley has agreed to buy Solium Capital, a Calgary-based administrator for employee stock compensation, for approximately $900 million in cash — a 43% premium over Friday's closing price. Go deeper. "Dogs from affenpinschers to Yorkshire terriers are rounding the rings at the Westminster Kennel Club dog show," the AP notes. "Breed judging began Monday at the illustrious show in New York." "This year’s Westminster show features two new breeds, the grand basset griffon Vendeen (grahnd bah-SAY’ grih-FAHN’ vahn-DAY’-ahn) and the Nederlandse kooikerhondje (NAY’-dehr-lahn-seh KOY’-kehr-hahnd-jeh)."